I’m so excited to be a guest artist over on the Newton’s Nook blog! If you’re just popping in today and we haven’t yet met – nice to see you! I live in Washington State where I live with my own kitties – Punch and Tsuki. (I know lots of you Newton’s Nook fans love cats like me!) I’m a bit of a coloring nerd…any medium, any time is my jam, and of course the sweet stamps at Newton’s Nook Designs are perfect for that! I’ve seen folks stress out about what to do if they don’t have a color they want in a particular brand of watercolor. And ya know what? It’s totally and completely ok to mix brands! (GASP!) I also have lots of folks asking how make a nice smooth background in a sky….so I’m showing you a paper towel technique on rough watercolor paper, and it worked pretty darned well! Check it out in the video below, or click HERE to watch in HD on YouTube. I love using Arches Rough Watercolor Paper when I watercolor; there’s just something about the way paints move on this extra-textured paper that’s unique! If you’ve ever struggled with getting watercolor to flow the way mine did, try the paper and see if that helps. I mixed Weathered Wood Distress Ink (stamped as well as painted) with Hydrus Watercolors for this card. 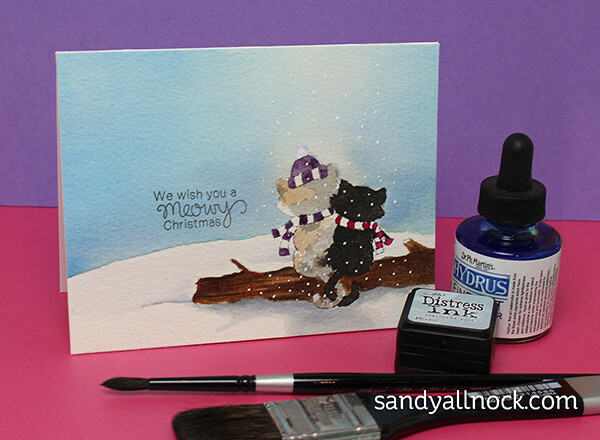 The #6 Black Velvet Brush I used on this card is one of my absolute favorites from the Silver Brush company – they get such a nice fine point on them, and that’s important for me in getting my brush into the nooks and crannies. Their 1″ flat brush works well for backgrounds too. Thanks so much for joining me for this little kitty fun….have a meowy Christmas, everyone! This is such a well-done painting. I love watching you blend soft and hard edges. Thanks for being my inspiration. I don’t know if you heard about our humongous Wind Storm in Spokane. We finally have our power and cable back and I can catch up on over 3 weeks of email!!!! You rock! Awesome painting Sandy! 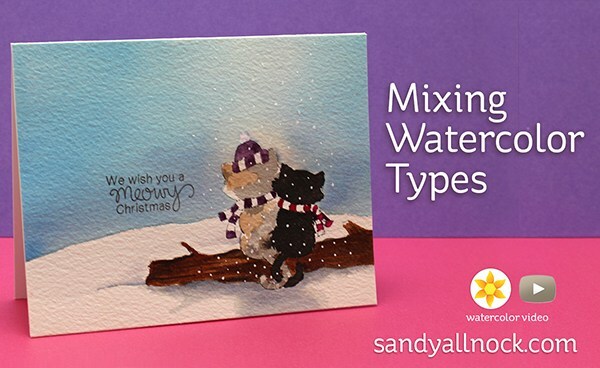 Love your card and thank you for showing us how to mix watercolors. I didn’t realize that Hydrus watercolors were permanent. I’m just learning about how to layer my watercolors, so this was very interesting to watch. Thank you!! This is gorgeous! I love this card and really enjoyed your video too. I’ve never used that type of watercolors before and they look really fun to play with! Thank you so much for being our guest this week! We really love your inspiration! Such a cute card. My kitties get along sometimes and last week they were laying down holding paws. I think we could all take a lesson from them…there is always room for love and peace. Absolutely love this card, Sandy! The sky is delightfully soft – thanks for the technique tips. You’ve made me decide to add Hydrous watercolours to my wish list – I love the layering. Absolutely gorgeous! I’m a cat lover and big fan of Newton’s Nook stamps. Your watercolour is beautiful – great video! Oh my, Sandy, this is so adorable. Thanks for the video. Thanks so much for this video. I didn’t realize that hydrous watercolor would be permanent when dry. I need them! wow, that is crazy good! Awwwwwww! Such a sweet little card—love the watercoloring! Newton’s Nook stamps are off the chart when it comes to cute! I’m delighted that you have a guest spot with them and I’m quite sure Punch and Tsuki approve as well. 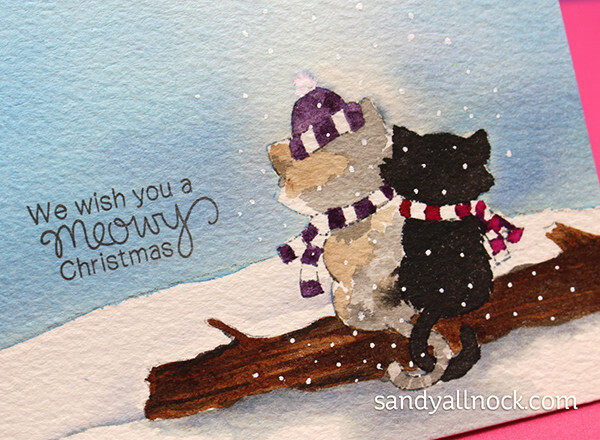 Lovely rendering of the snuggly cats on your card! Thanks Sandy!